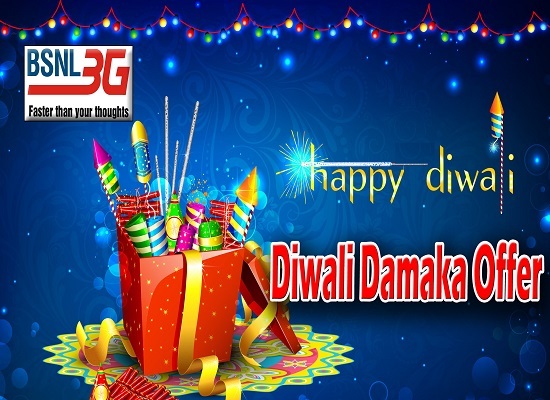 Bharat Sanchar Nigam Limited (BSNL) has announced 'Special Diwali Damaka Offers 2015' for all Prepaid Mobile Customers from 7th November 2015 onwards on PAN India basis. BSNL already announced the launch of new Special Tariff Vouchers (STVs) on the festival season of Diwali. As per the latest information, BSNL will be offering a variety of Combo Vouchers whose freebies may vary for each telecom zone. Freebies include - Free Talk Time / Usage Value, Free 3G/2G Data, Free SMS and reduced local / STD call rate. These offers will be available for a period of 60 days. 251* Rs.125 Usage value + 500 MB Data + local/STD OG calls( in Home LSA) @35 paisa/min 7 Days The validity is for Data and reduced call rate only. The Usage value has no validity i.e. to be credited in main account. *Circles can suitably adjust the MRP in the price band by + Rs.1 to + Rs. 4, considering the technical feasibility. West Zone includes the following telecom circles:- Gujarat, Maharashtra, Madhya Pradesh & Chhattisgarh. East Zone includes the following telecom circles :- Andaman & Nicobar, Assam, Bihar, Jharkand, Kolkata, North East I, North East II, Orissa & West Bengal. (254 for Kerala Circle, To activate: Recharge 254) Rs.201 Usage value + local/STD OG calls ( in Home LSA) @35 paisa/min 7 Days The validity is for reduced call rate only. Also, the Usage value has validity of 2 days. ** Circles can suitably adjust the MRP in the price band by + Rs.1 to + Rs. 3, considering the technical feasibility. North Zone includes the following telecom circles:- Punjab, Haryana, Himachal Pradesh, Rajasthan, Jammu & Kashmir, Uttar Pradesh (W), Uttar Pradesh (E) and Uttranchal. South Zone includes the following telecom circles :- Kerala, Tamil Nadu, Chennai, Karnataka & Andhra Pradesh. All the other terms and conditions will remain same. The above tariff will be implemented with effect from 07-11-2015 to 05-01-2016 on PAN India basis for a promotional period of 60 days. Dear readers, please share your views and opinions about this newly announced Special Diwali Damaka Combo Vouchers via comments with us.